For an attractive, durable, maintenance-free surface, pavers have much to recommend them. They can be used for pathways, entertaining areas and pool surrounds. There are many different colors, shapes, textures and materials from which to choose. The clay ones are more hard wearing and will keep their color longer than cement. The darker colors in clay pavers are usually the hardest and strongest. Special salt and chemical-resistant varieties, some with rounded edges, make a suitable surround to swimming pools. Many patterns (also known as bonds) are available. The common sizes for pavers are 230x115 mm and 220x110mm. A minimum thickness of 40mm is required for paths and patios. For driveways, use pavers 50-65mm thick. 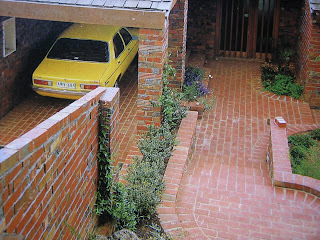 Ordinary house bricks can also be used as pavers. By varying the color and pattern, and perhaps introducing some curves, the results with pavers can be spectacular. Do try to avoid having to cut too many bricks. A brick that is cut by a carborundum wheel in a circular saw is suitable for most pavers.